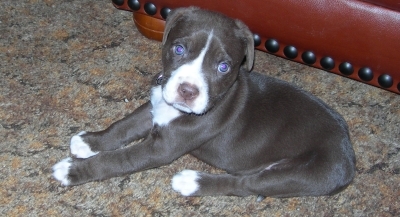 Meet Merlin--our new pitbull puppy! Isn't he gorgeous? My husband and I hadn't planned to add a dog to our fold right now. (We have two senior pit bulls already.) Alain thought he was helping a friend get a nice puppy. But, when it didn't work out he came home with this little guy wrapped in a blanket--"just til we can find him a good home". Yeah right. Merlin had me at "hello". I could look at him all day long if I didn't have to work, run errands and the like. Alain's not as quick to admit it, but he's pretty smitten too. The ultimate hurdle now will be his acceptance into the pack by our other fur children. Both of them are dog tolerant, but an eight week old pup has a lot to learn about doggy etiquette. So, we are approaching this carefully and supervising all their interactions at this point.